LED signs are more than just an incredibly powerful advertising tool; they can also be part of a corporate strategy to identify retail locations and solidify a brand. An on premise LED display in front of a retail location enhances the identification provided by a corporate logo, but the validation as a retailer goes deeper than that. The dynamic content on an LED sign can mirror product advertisements in more traditional media, plus it offers the opportunity to promote specials that can change hourly, daily, or based on weather conditions or inventory changes. An LED sign is an invaluable informational display for any retailer. 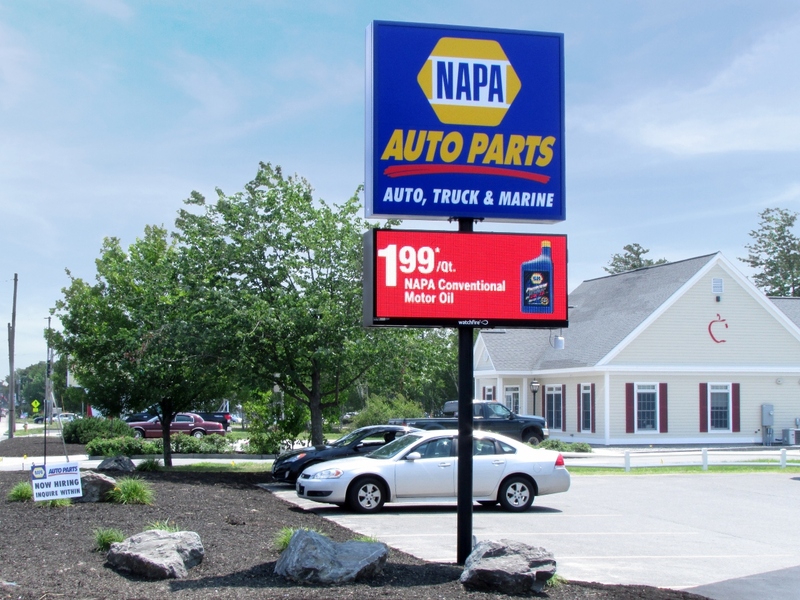 NAPA Auto Parts of Maine and New Hampshire understands the power of LED signage. They have an outstanding reputation as the manufacturer of quality replacement parts for vehicles, and have built a solid business in the wholesale automotive parts industry. The importance of distinguishing NAPA corporate locations as retailers became an important part of their overall corporate strategy to boost the brand among general consumers of auto parts. Steve Milton, District Manager with NAPA Auto Parts of Maine and New Hampshire says that is precisely why he utilizes the advertising power of digital signs at all of his region’s corporate locations. Milton prefers the flexibility and responsiveness of the digital signs they’ve purchases from Watchfire. “We can run several messages each day, mirroring corporate promotions,” said Milton. NAPA works with a local advertising company to create ads and bring in content produced by Watchfire as part of their national corporate program. This allows the managers of each store to focus on other areas, like training for their counter staff in the “Know How to Ask” method of promoting daily specials to retail customers.